Degges-White also has tips for parents who are coping with rude teens. Remember that pushing boundaries and working to create separate and unique identities beyond the family boundaries are normal and healthy behaviors for teens. How did you rebel against your own family growing up? Teens typically use fashion choices, music preferences, vocabulary and peer groups as components of their attempts to liberate themselves from the confined boundaries of being “Jake’s son” or “Jessica’s younger brother.” Sometimes, an adolescent’s personal fable may involve fantasies of being a “changeling” who has cooler and hipper parents somewhere out in the universe. That’s okay for this stage of behavior – and totally normal. Monitor your own behavior from the moment you first find out that you are going to be a parent! As we know, social learning is where our kids pick up the lion’s share of their social behaviors. If we yell at the neighborhood kids who run across our lawn or get surly with the slow cashier at the drive-through, odds are that our children are logging this information and it will inform their own responses to others when things don’t go their way. Children cannot be what they do not see. The dangers of helicopter parenting are well known now, but many parents still wrongly believe that hovering and befriending their kids are the greatest gifts they can offer their as parents. This is simply not true, and allowing these dynamics to develop may be one of the most significant contributing factors to adolescents’ seemingly growing levels of rudeness and lack of courtesy to others. When you reflect on the behaviors and expectations that you have of friends, ask yourself if this is really what you want in your relationship with your child. We don’t expect friends to always do what we advise or to do what we think is right. However, most of us do expect our children to mind their manners and mind what we say. As for the “helicopter parenting phenomenon,” think back to your own teen years – would you have wanted your mother showing up at your school and threatening the kids who were teasing you, or arguing with the teacher who rightly gave you a failing grade? In adolescence, we typically want to distance ourselves from our families; when we are forced into the role of “arrested dependent,” we may find other ways to rebel and may act out our frustration with the parents who are simultaneously fighting our own battles as they compromise our normal adolescent drive to assert our independence. Be a “zero tolerance” parent concerning rudeness, even if it makes you unpopular with your kids. 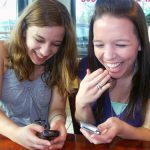 When we see teens being rude to others, often the first question that pops into our adult brains is, “Why didn’t their parents teach them how to be polite?” Teens who get away with unacceptable behaviors at home are certainly more likely to try them out in public; however, teens may also show their “bad boy” or “bad girl” side more freely out in public as they try out new identities and exercise their rebellious streak. Doing all that you can to enforce good behavior at home and in public is important. And if you are present when your teen exhibits behavior that makes you cringe, remember you’re the parent, not the friend, and remind her of her missteps. News stories and psychology textbooks often reiterate the inherent resiliency of youth to negative experiences and abuse. 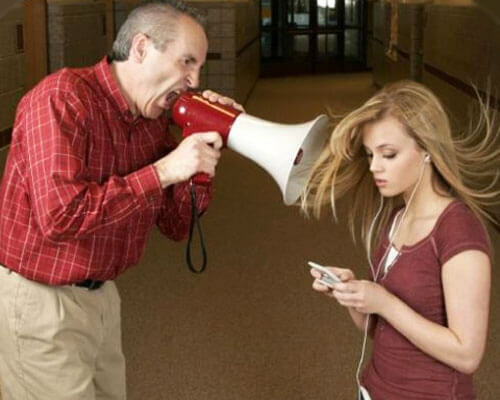 Correcting your teen’s manners and calling her out for rudeness is not going to ruin her self-esteem permanently. Empower yourself, your friends and the parents of your teens’ friends to expect and request respect and courtesy from your child. Many parents are uber-protective of their child and are quick to defend their children’s poor behavior. Don’t be one of those parents – be the kind of parent who owns their responsibility for raising a good citizen of the world. In management training, it’s frequently noted that good managers must make decisions that their employees will not always like. It’s the same for good parents – decisions must be made that children do not necessarily like. And that is OK. If one of your “executive decisions” is to enlist the aid of your friends in keeping the team inline, that is OK, too.